When Raphael Lemkin coined the term genocide he defined not only the intent to destroy a group of people but the deliberate aim of erasing their cultural legacy. 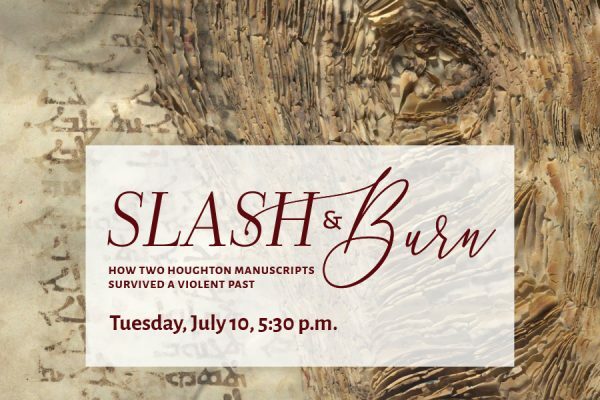 Dr. Sylvie Merian will focus on two manuscripts now held at Houghton Library, which she discovered while a Houghton Library Visiting Fellow/Katharine F. Pantzer Jr. Fellowship in Descriptive Bibliography 2008-2009. Both manuscripts were violently attacked during the 1894-1896 Hamidian massacres in the Ottoman Empire. This brutal attempt to annihilate Armenian literary tradition will be contextualized through several examples of the deliberate destruction of significant cultural artifacts, not only for the Armenians but also in world history. Examining the history of cultural genocide highlights the importance of artifacts as key to the survival of the Armenian people. Speaker: Sylvie L. Merian received her PhD in Armenian Studies from Columbia University’s Department of Middle East Languages and Cultures. She has published and lectured internationally on Armenian codicology, bookbinding, silverwork, manuscript illumination, and the history of the book. She is currently Reader Services Librarian at The Morgan Library & Museum in New York City.